I missed your earlier posts so glad I caught this one. Appreciated all about tea specially since we actually grow it. I am just about to take some Camomile tea,it helps me settle into sleep. It dawned on me the other day that i'm fresh out of my absolute favourite flavoured green tea; Peché Mignon, it's the most delicious cup you can imagine, either hot or iced. I so long for it right now but alas i'm too poor right now to send for it from Théodor in paris, but i warmly recommend it to you, for your pleasure. Meanwhile i'll make do with thé a l'opéra from Mariage Frères. L'oisive thé et tricot. They sell tea of course but also yarn! Charmant. As always, I love your blog! I have been having tea on my mind this week as well! I did a blog post this week about floral essences in pastry and tea (one of my favorite topics, actually!). I love coffee everyday, but will chose tea in every form as something special and something to be savored. I love different teas in different ways, some hot, but some I actually prefer iced. I love nothing more on a hot day than a large glass of sweetened peppermint tea (brewed strong) over ice and we find iced Earl Grey to be especially refreshing as well! The most special teas I drank were in Paris and fell in love with caramel tea there! Can't wait for your post tomorrow! I love pomegranate tea too…but lately peach tea is my fave. (and green). It is so relaxing and theraputic to sit down with a cup of hot tea:) Have a great weekend! Oh, I'm late on the tea chat! But I MUST share with you two teas that I absolutely love (and I'm sorry, it's so plebian of me, but one in particular is a mass-produced teabag)….that one is Bigelow's Vanilla Chai tea; I don't know WHAT it is about it, but I'm addicted to it lately! There's some scent in it that is so calming; not sure if it's the vanilla or not. The other is Tillerman Tea's (from Napa, CA) Nami Genmaicha. It's a green tea with toasted rice and it's fabulous. You can get other toasted rice teas from other companies; the first I bought was from Leaves in SF and it was in bags in a travel tin. I just love tea! And in regard to your penchant for porcelain cups, I can't recall who said it now, but he said that tea and coffee just tastes better in a china cup…he's so right! what can i say about your blog post to day ? so lovely !!! thank you from a french woman in south west of France . There are many ways to approach a cup of tea. I personally am not a fan of people who try to drop Company names, etc. in a vain attempt to impress. For me, drinking tea is a beautiful way to celebrate the leaf and its power to transform a single moment. Something good always comes from a cup or pot of tea. How we interpret that is of course an individual experience. Two books that express the beauty of tea and educate the reader are the "New Tea Lover's Treasury", by James Norwood Pratt. Another wonderful book is "The Spirit of Tea", by Frank Hadley Murphy. I have had the pleasure of sharing and discussing tea with Mr. Murphy and highly recommend his book for anyone who is serious about tea. Mr. Pratt is also a true Master of tea and writes with witt and integrity. Just the sound of lime blossem tea makes me think I drank the little white blossems! Oh our tea! Mine has to be boiling hot. Mine has to have a floral hint. Mine rinses my mind and refreshes my body. I have had tea on my mind for the last few months and can't find the reason why. I love love green tea. It taste like our earth to me. I too love it in mugs then in thin procelian cups…? It is a mystry, tea & me. 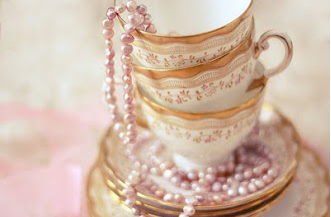 I am in love with these tea cups! Beauitufl. Enjoyed reading you take on tea. I love all this talk of tea (hot or cold), and I can't wait to get my hands on some of those books you recommend. Where shall we go for our next cuppa? I must have my coffee in the morning; however in the evening a hot cup of tea is wonderful (Earl Grey still my favorite) In Spring and Summer I love Iced Tea, sweet. This is a fun topic. I enjoy reading about teas I haven't tried. It's always fun to try something new. I've just had a lovely time catching up on your week's posts Vicki, how tragic you've had to give the java the flicko! You are stronger than me my girl, I just couldn't do it. I don't drink tea, have never even had a sip, so I would be in dire straits. I am fussy about the coffee I buy & even fussier about the drinking vessel & have a precious collection of Royal Albert mugs that are mine alone. MOTH had the misfortune to drop one recently & he's been sinned binned until further notice. He thought that lending me his clunky 'Old Rowers Are Oarsome' mug would spring him, it hasn't. On my winter break in Santa Barbara, I discovered Citrus White Tea at the Biltmore Spa. It has become my breakfast drink and afternoon pick-me- up. Do you know about the tea books by Bruce Richardson? I think you might enjoy has wonderful images, recipes, and tea ethic. I'm using your CLARINS light serum and I too am adoring it!So, Thank You for that post!I ran out to buy it and have been using twice a day! Thanks for the tip! Will have to download it & read – yay! I’ve been following Aaron Fisher’s articles for The Art of Tea magazine and the online tea journal “The Leaf” for a couple of years now, so I was really looking foward to reading a full-length work devoted to the Way of Tea. Surely you will find or may have read books on Chado, or Chanoyu, the Way of Tea as expressed by the Japanese tea ceremony… This book is positively different and will be a pleasant counterpoint to others you may have read in that it centers on what the tea ceremony is really all about in a spiritual sense, as opposed to other books that aim to serve as as instructional guides on how-to-perform the Japanese tea ceremony.